The reduction in aerodynamic drag of two-truck platoons provides unprecedented fuel savings for both the trailing and the leading truck. Independent fuel efficiency testing by a major fleet, NACFE, and the U.S. Departments of Energy and Transportation has shown double-digit fuel savings. The aerodynamic improvement allows the front truck to save fuel along with the rear truck. Driving can be unpredictable. The Peloton system is designed to support the capabilities of the driver by reacting more quickly, more accurately, and more reliably, than a driver normally can. During manual driving, safe following distances between trucks are maximized to allow time for driver perception, reaction, and brake lag in both trucks when responding to an obstacle ahead. 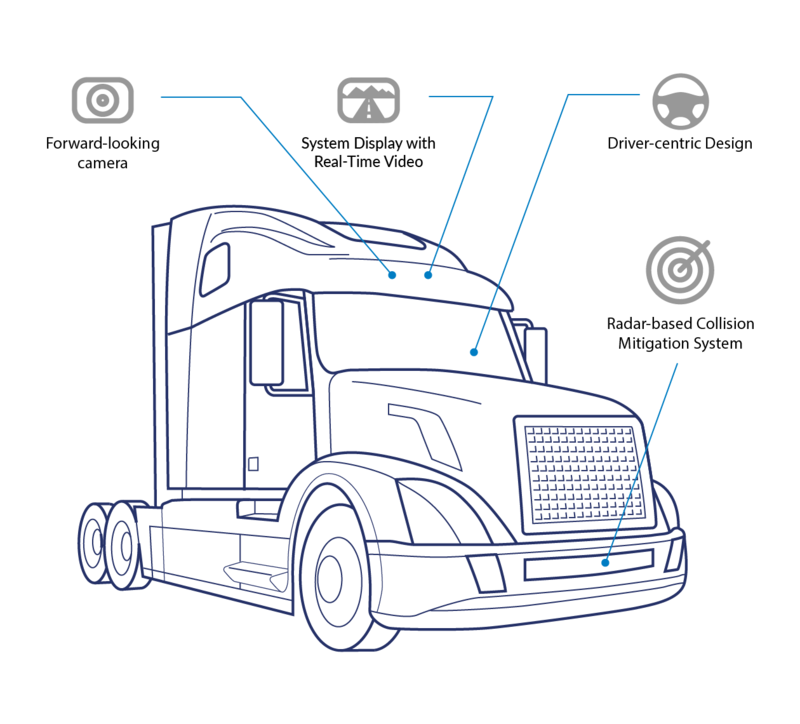 Adding a radar-based collision mitigation system cuts out driver perception and reaction, but still must allow for radar to detect the front truck slowing before the rear truck’s brakes can be applied. In a platooning rear truck, the steering is manual but the braking is automatic. The Peloton Platooning System uses truck-to-truck wireless communication, allowing the rear truck to automatically initiate braking even before the front truck begins to slow. This nearly instantaneous reaction means trucks can safely follow at smaller distances and save fuel. Click each item for more detail. Peloton’s Network Operations Cloud (NOC) provides eligibility for each platooning operation. Continued monitoring means we’re “always aware”, able to pair trucks or dissolve platoons at any time in response to changing weather, traffic, truck, or other conditions. We incorporate truck data and the external environment to ensure driver safety at all times. 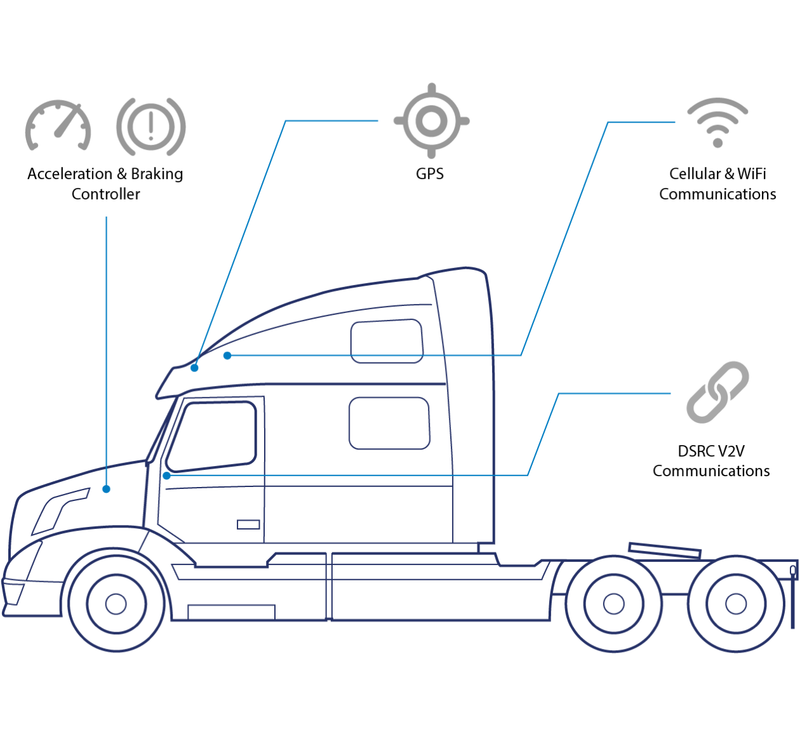 Our cloud­-based NOC identifies and monitors all trucks, ­arming each driver with the best information, monitoring truck condition and safety, gathering and analyzing data, and facilitating platooning when appropriate. We use the strongest available, independently audited systems. We encrypt all communication between trucks and with the Network Operations center. All communications are mutually authenticated. We actively monitor for and defend against malicious attacks. Our systems are continually improved through automatic over-the-air updates. A video camera allows drivers to see views from the other vehicle on the in-cab system display when platooning. The following truck’s braking and acceleration are synchronized with the lead truck, while each driver maintains steering control. This link, combined with shared collision mitigation systems, allows for closer platooning following distances. Cellular & WiFi modems connect vehicles through an encrypted channel to Peloton's cloud-based Network Operations Center (NOC). The NOC tells trucks where and when they can platoon and under what conditions. Trucks relay information about road conditions and truck status to the NOC. The Peloton system minimizes the cost of transmission by only sending high-priority data over cellular. Low-priority is retained on the truck until it reaches a WiFi hotspot. The system ensures only trained, validated drivers are able to engage the platooning system. An acceleration and braking controller allows the Peloton system to maintain a steady gap between two platooning trucks by controlling the speed of the rear vehicle to match the front vehicle. Each driver maintains steering control during a platoon. This link, combined with shared collision mitigation systems, allows for closer platooning following distances. Drivers enjoy secure voice communication with each other. This helps us make sure everyone has the information they need, when they need it. Platooning is the first commercial application of Vehicle-to-Vehicle (V2V) communications technology to improve safety and fuel efficiency today. We use 5.9 GHz Dedicated Short Range Communication (DSRC) for a reliable truck-to-truck link. We ensure its security through a variety of strong encryption protocols. To ensure platooning is safe at all times, we dynamically manage the geographic areas and conditions in which platooning can occur on divided multilane highways under lower traffic conditions. Our cloud­ based NOC identifies and monitors all trucks ­arming each driver with the best information, monitoring truck condition and safety, gathering and analysing data, and facilitating platooning when appropriate. A radar mounted to the front bumper of every truck tracks dozens of objects simultaneously 50 times per second, constantly monitoring the road ahead. In the event of a sudden slowdown or obstacle, the system can engage the brakes faster than a human driver to avoid a collision. When platooning, the rear truck is linked to the front truck's radar so the braking of the two trucks is synchronized. Highly accurate GPS provides precise location data, enhancing vehicle control safety and location-based functionality. Drivers use the system display to identify platooning opportunities, view system status, and view the linked video. When platooning, the front driver can see his or her blindspots from the back driver's perspective. The back driver sees a clear view of the open road from the front driver’s perspective. When the driver makes the decision to begin platooning, we’ve created an easy set of controls that are similar to the current look and feel within the cab. The Peloton System has been designed from the ground up to be intuitive for drivers to use via a simple set of controls dedicated to platooning. The system ensures only trained, validated drivers are able to engage the platooning system.